I'm not sure what to make of this one. I feel a bit sleazy just posting the trailer. I probably won't even watch this garbage, but if I do, it will be out of sheer curiosity. I'm not sure what to make of this Jason Freeman character either. Initially, I thought he was a pretty decent guy... at least that's how he always presented himself. At this point, he just comes across as another nutjob. Isn't he the person who was supposed to ensure that Manson had a "proper burial"? It seems he definitely failed in that area. I don't think anyone (in their right mind) would define this circus as a "proper burial" at this point. I want to watch but we don't get Reelz Channel. I keep hearing Freeman isn't really Manson's grandson, does anyone know? 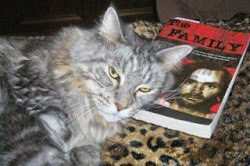 I read Freeman's book and I thought well leave it to be Manson's grandson to be a martial arts fighter and a Born Again Christian, how appropriate. I remember the outrage that ensued when it became known that there was a single still photo of Manson in his casket. Turns out, someone videotaped the entire day? And none of the guests knew they were being filmed at the time? In retrospect, if privacy was Manson's final wish, they should have just let the State cremate his remains. I'm sure there were some well-meaning folks at Manson's funeral, but this has not gone well. I agree Walrus! Charlie not only created this circus, but perpetuated it for the rest of his life. It's not surprising that his "offspring" would join in to continue this charade. I'm nearly certain that Jason Freeman is Manson's grandson. It seems to me he's son of Charles Manson Jr. the one that changed his name to "Ron White" or "Charles White" or something like that. I think he committed suicide. I seem to remember DNA tests being taken and they did prove Freeman was Manson's grandson. I don't get Reelz channel either, but I expect that film will show up online not long after it's on TV. I expect they paid Freeman for the film of Manson's funeral. Possibly a fairly large sum of money. I can't blame him for selling it, I mean he's had to live with the name "Charles Manson" in his background his whole life. If Manson would have been offered a large sum of money to film Freeman's funeral, what do you think he would have done? It seems to me Manson's body was cremated and his ashes spread somewhere, that was part of the court order for Freeman to get custody of Manson's remains if I remember correctly. I haven't looked this stuff up much lately, but I'm pretty sure it's all online. The Walrus' comment reminds me of the Bates Motel. This whole case is a drama queen's plethora. Everyone from every corner of the drama is going to weigh in. I, for one, agree with Walrus. This whole drama is like the Big Top! Every carny act in town is going to go in for one more push/pull. Charles Manson didn't deserve privacy in his kill-driven agenda. Neither did his followers! They all opted for being observed, like idiocies under a microscope. The minute they signed on for being single-minded killers of folks they didn't even know! They all followed Manson, like mindless idiots. Why? Who knows? And under the same spectrum, Manson, who acted like a zombie idiot in killing folks he didn't know, fell under the same microscopic inspection. Thanx for the comment walrus. I didn't see the program, I haven't heard the name George Stimson or seen a pic of him or Sandy for years. He used to have a blog. Sometime when I have time, I might try to find the Reelz program online. Time is catching up with all of us. Thank you guys for making me feel welcome. I don't comment, I just read the blog. I just could not hold back on this one... For me, seeing Sandy older was like pulling back the curtain on the wizard. I was so afraid of these people when I was a kid. Bobby still scares the crap out of me. He just looks scary. Sunset77 I hope you get to see this train wreck soon. Unfortunately, I don't get the Reelz channel either. Hopefully, a copy will surface online soon. I'm pretty sure that Lynne Fromme's parole terms stipulated that she could not reside in (or visit) California (or something to that effect). I wonder if she's still restricted from entering California? I'm kinda surprised that Lynne wasn't present for Manson's funeral. In short, yes, Squeaky can be restricted from traveling to California, or anywhere else, that either the court, or her probation/parole agent feels is necessary. It is inclusive under 18 U.S.C. SS 3553(a)(2)(C) and (D), which covers public protection and rehabilitation. In essence, the Federal Government said “we will release you but under our rules, not your wishes...”. The thought process being, and some studies support, that an parolee is less likely to re-offend if their contact with former associates is restricted. I watched the funeral documentary, and while I came away thinking “meh”, I went into it with absolutely no expectations. That being said, I believe that Jason Freeman came across as a sympathetic albeit, somewhat as a lost person. To me, he was struggling with the guilt of his father’s suicide, knowledge of direct lineage to the Wooly Hophead, and not knowing how to rationalize it all. It appears that he was beset with a few nuts at the funeral ( I mean how many times does one person need to kiss a corpse? ), as well as a camera crew, and as a result tried to serve their needs rather than his own. I would agree that his wife is the best thing he has on his side and that came through clearly. It is my suspicion that the makers of the documentary knew whet they wanted to go, and as such, directed an emotionally, and simple person, unwittingly in that direction. It was an interesting footnote of sorts, kind of an anti-climatic end to a nearly fifty year saga, where it, not the players themselves, seem to reinvent itself every few years.